I can't solve an issue for you if I don't know about it. New ListingiHome iP37 Portable Stereo Speakers - Iphone Ipod Dock. Great consition! Bluetooth version: Bluetooth V2.1, compatibility with V2.0 and V1.2. 1 x Bluetooth Speaker. we are NOT responsible for. What if I want to use expedition sevice?. Rated power: 1.5w 2. If you are in Alaska, Puerto Rico and Hawaii, it might take longer. This bluetooth waterproof speaker with suction cup & integrated microphone will allow you to keep listening to your music or picking up a phone call. Waterproof and dust-proof mini Bluetooth speaker. 1 × Blcck Color Bluetooth speaker. Super bass and good sound quality. This speaker can be used to answer calls. Pairing with your iPhone, iPad or any other smart phones. color：black. ML # 410BK. with AC Adapter and AA Batteries 1.5 V for your beach or park getaway. works and sounds great. I have tried my very best to be as honest as possible in representing this item. Be as specific as possible. Sold as is. Super cool…super legit. I don’t think it’s even been used. Twist speakers to expand, use two speakers for stereo or a single speaker for mono. Sound Beyond Size! The iHM78 is the perfect stereo speaker system for your iPod, iPhone, iPad, Macbook or any Laptop and MP3 player. [New Release] AideTek Bluetooth 4.0 Portable water-proof Wireless speaker 10W Output Power w/ 15 hrs Music Streaming & Hands-Free Calling Built-in Micmusic build in Microphone for iPhones, iPads, Androids, Samsung and all Phones, Tablets, Computers-Black. Listed is this portable iPod / iPhone speaker system from Logitech model MM50. Item uses the older styple of plug. make Supersized seem small. Unleash your music with the Satechi iCraft! Satechi iCraft has enough power to fill a room with crystal clear sound from its four full range neodymium dynamic drivers. Satechi iCraft Dock Station Stereo Round Speaker. JPQ-002 PORTABLE SPEAKER & 3.5MM AUDIO JACK FOR iPHONE & ANDROID - FREE SHIP! 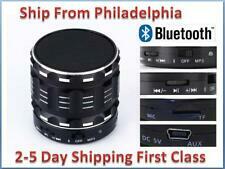 JPQ-002 PORTABLE SPEAKER & 3.5MM AUDIO JACK FOR iPHONE & ANDROID - FREE SHIP!. Condition is New. Shipped with USPS First Class Package. OF NOTE: Bring the party where ever you go with this portable iHM27. This stereo speaker system uses any. specially designed speaker chambers with EXB circuitry. Get clear, crisp sound with expanded bass that brings out the best in your music. 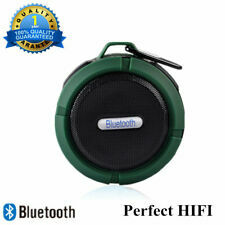 Indoor/Outdoor Wireless Bluetooth Speaker Music Player foriPhone iPad Smartphone. Speaker Type：Outdoor & Indoor portable Bluetooth Speaker, Bicycle Speaker. Unleash great sound wherever you go with this portable tube speaker. Equipped with a USB charging cable. Unique design -- Retractable speaker. Speaker Unit size: 3.5 (mm). 1 x Speaker. 1 x USB Charging Cable. Color: Black, White (Optional). Frequency response range: 200-20K (Hz). Mono, 2-Way Speaker. Used : An item that has been used previously. The item may be a factory second or a new, unused item with defects. Play mode: Bluetooth, AUX, TF card. Bluetooth 4.0 Technology :compatible with all Bluetooth compacity devices.Speaker automatically reconnects to the last device used. Multi-Functions : bluetooth speaker, Hi-Fi stereo, Language prompt function, Hands-free call function, support TF card and 3.5mm audio interface. Portable Speaker Dock. SONY RDP-M7iP. Used item in good working condition. With Remote and power cord. Portable speakers and base fit together for quick and compact travel. INCLUDED : Stereo speakers with 50mm Drivers, Base and Stand for iPhone, AC Power Adapter and a quick start guide. Powerful speakers with interference-free digital amplifier. Bluetooth Speaker, Ultra Portable Pocket Size Wireless Speaker with Bluetooth, Aux-in, Passive Subwoofer, Enhanced Bass, Ultra Compact Lightweight Mini Speaker for iPhone, iPad, Samsung. Bienna Bluetooth speaker also features a microphone built in. Condition is Used. Tested and the speaker works perfect. Up for sale is a new pair of Earthquake IQ-52b powered speakers. Amazing sound! Local pick up in Santa Clarita is ok! Build in two Speakers reveals powerful bass excellent in sound quality. 2-in-1 audio/charging cable included. Mini Wireless Bluetooth Speaker. For SAMSUNG, HTC, LG, NOKIA, IPHONE, IPAD, IPOD, OR ANY OTHER SMARTPHONES. The InMotion iMT630 Ultra-Portable Speaker Series combines contemporary styling with portability. When not in use, the remote neatly tucks away into the back of the speaker system, minimizing clutter. Trending at $23.56eBay determines this price through a machine learned model of the product's sale prices within the last 90 days. Waterproof case with built-in speaker. 3” full range forward firing speaker. Designed to fit mp3 players and cell/smartphones including your iPhone 4/4S & 5, Samsung S3, Android, Windows & Blackberry. Vivitar Blast Box. Uses 3AAA batteries (not included). LED light indicator. On/off button. High Grade Speaker and Digital Amplifier for Superior Sound Quality Side Air Vent for Optimal Bass Elegant Cloth with Aluminum Trim Panel Design Slide Out Rear Stand for Added Support and Comfortable Use Side Up Back Support for Extra Safe Device Docking/Support Plays and Charges most iPods, iPod Touch and iPhone Fast 1A Charging for iPhone AC Operation using Separate AC-Adaptor (Included) Top Panel Electronic Volume Controls Low Power Consumption with Smart Auto-Off/On Power Total Power Output: 15 Watts Check out this mini iPhone/iPod speaker dock from Pyle Home. It's a convenient way to listen to music anywhere there's an AC outlet. It's small, portable, and has a big sound, and it charges your iDevice while it plays. The elegant cloth with aluminum trim panel design looks great, too. Only what is shown in the pictures is included, nothing else. No APO's or FPO's. Listed 30.